Yuko Mohri, I/O – Circus Without Circus, 2016, mixed media, dimensions variable. Inspired by John Cage’s performance piece Musicircus, 1967, which invites musicians of different genres to perform together, Yuko Mohri, in her latest exhibition, simulates Cage’s multi-ring conception of the circus. 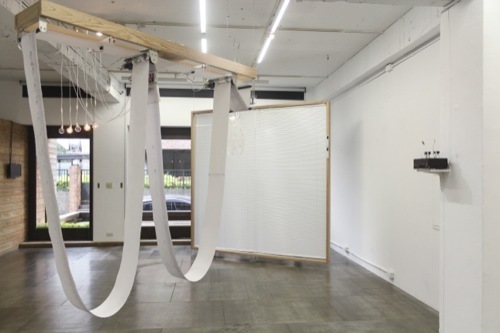 The piece I/O – Circus without Circus (all works cited 2016) spans the gallery space: scrolls of paper draped from rotating and stationary black tubes, suspended from two shelves hung from the ceiling; lightbulbs flickering; cables twitching and tapping at their ends, while connected to everyday objects—a ladle, a plastic bag, a pair of window blinds, a set of spoons, and an accordion sounding off against a wall. As in an orchestra, each element has its own sound and role, occasionally making a noise to catch your attention; and stopping just as you look in its direction. The work operates as an event and performance about light, gravity, and heat, never repeating and always in flux. It is perhaps fittingly stationed next to the single-channel video Everything Flows, with scenes of tree branches swaying in the wind, a pair of rings dangling on a sign, a garbage can turned on its side and blowing around, curtains swaying lightly in a room, and drapes of fabric from a window gently moving in the breeze. As Mohri reminds us, everything is connected, either by wire, circuits, or forces unseen by the human eye, and everything in essence ebbs and flows—has an input and output—conserved in this very symphony.